Cheers to tasty bubbles and sumptuous bon-bons! Introducing the Champagne and Chocolate experience aboard the barge Johanna. Welcome aboard the Champagne & Chocolate experience, a delightful culinary cruise, exclusive to the barge Johanna! Daily chocolate tastings and champagne samplings are offered, immersing guests into the region’s culinary bounty. Two gourmet dinners ashore inclusive of the cruise fare, coupled with the Johanna’s cultural discovery, offer casual travelers one of the best values in barging today. Owner-operators Captain Kris and Chef Patsie Rotsaert offer their guests a delightfully cosmopolitan experience, fueled by their ongoing multi-lingual conversation, effortlessly traversing between English, French, and Dutch, as both of them are Belgian. A maritime engineer by trade, Captain Kris pilots the Johanna with pride, and Patsie’s light and fresh cuisine is influenced by her training as an Olympic gymnast. Patsie’s savory menus emphasize seafood and produce, while her Belgian chocolate desserts and Champagne pairings are inspired and exquisite. Her special chocolate coffees, often enjoyed while lounging on the Johanna’s deck, are always a crowd-pleaser! Two dinners are enjoyed ashore, and are included in the cruise fare; Kris and Patsie will recommend local bistros, and provide transport to and from the dining venues. Johanna’s three cabins boast ample built-in storage space, and are cheerfully decorated with pops of color, while the vessel’s salon and dining area is tastefully decorated in neutrals, offering comfortable seating and an abundance of natural light. On the flower adorned deck, guests can laze under the canopy while watching the bucolic scenery pass by. Excursions to visit the historic treasures and and military monuments of the Champagne region complete the daily sightseeing. In between enjoying tasty bubbles and delectable bon bons, guests can always explore the towpath on foot or by bicycle and wander into pastoral villages along the route, or play with the two other permanent crew members onboard the Johanna, Babou and Cotenoir, the barge cats. In the afternoon, you will be met by a crew member of the Johanna at the designated meeting point in Paris. 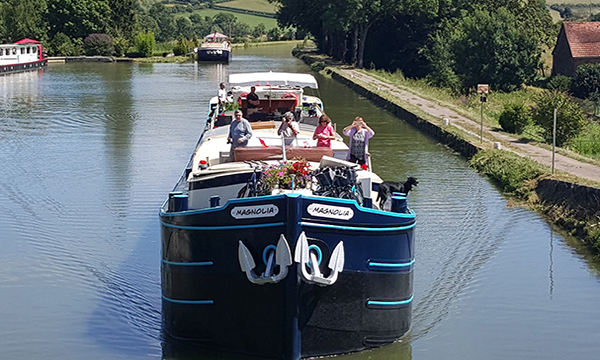 From here, relax as you are chauffeured to the barge, moored in Chateau Thierry. A champagne welcome and introduction to the crew awaits, including the barge cats, Babou and Coténoir, who are friendly and spend most of their time in the crew area. Explore the small town of Château-Thierry before Chef Patsie presents the first of many chocolate and Champagne dinners onboard. The adventure begins with a morning cruise, presenting the perfect opportunity to relax on deck with a cup of Chef Patsie's special chocolate coffee. A morning visit to Belleau Wood memorial site and the American WW1 memorial can also be arranged for those especially interested in Champagne's military history. The afternoon, enjoy the first of many champagne tastings ashore; time permitting, visit the local eco-museum, Chatillon-sur-Marne panorama, or the Dormans WW1 memorial. Back onboard, Chef Patsie's is preparing tonight's delicious dinner. During the morning cruise, foodies are invited to join Chef Patsie in her open kitchen to observe her techniques for cooking with chocolate. In the afternoon, your Tour Guide escorts you to the village of Hautvillers where Dom Perignon first invented the famous drink! Enjoy Champagne samplings at houses both emerging and established while admiring panoramic views of rolling hills and endless skies. The area’s culinary bounty is on further offer tonight, as dinner is taken ashore at a local bistro. This morning, your Tour Guide accompanies you to the small city of Epernay, home of the world-famous Champagne Avenue. Tour the cellars and taste the bubbles at one of the renowned champagne houses. Return to the Johanna for an early afternoon cruise. Upon mooring, Champagne's extraordinary natural beauty is revealed during a mid-afternoon visit to the Reims Mountain National Park. Observe the Verzenay lighthouse and explore the world's principal reserve of dwarf beech trees. Back onboard, dinner culminates with a decadent chocolate dessert. As Johanna continues her lazy journey along the canal this morning, explore the towpath by bicycle or on foot. Afternoon visits to the charming village of Chalons-en-Champagne include a stop at its collegiate church, Notre-Dame-en-Vaux, which boasts a 56-bell carillon. From there, perhaps sample the suds at a local beer brewery, or take a scenic stroll in the “Petit Jard” and “Grand Jard” gardens. Dinner tonight furthers the local immersion, as it is taken ashore at a small brasserie. 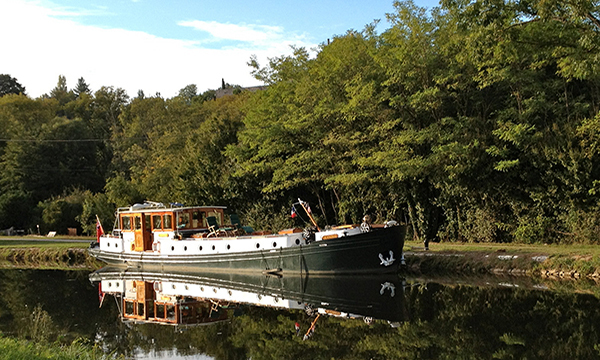 During this morning's final cruise, hop off at a lock for a gentle pedal or leisurely stroll. This afternoon, your Tour Guide escorts you to Reims for a tour of the Cathedral with Chagall’s famous stained glass windows. Here is where the Kings of Queens of France were crowned! Then, a tour of a recently restored mansion,"Villa Demoiselle”, can be combined with a sampling at the nearby Vranken champagne cellars. Return to the Johanna for the Captain's Dinner, with chocolate and Champagne served at every course! After breakfast, you will be chauffeured to the designated drop off point in Paris.